www.sausagemaking.org • View topic - Have I just ruined my first ham? Have I just ruined my first ham? I used a mixture of cure #1 with salt, sugar, peppercorns and a bay leaf and boiled it just until the salt and sugar dissolved. The pork (boneless) weighed 2.5kg and has been curing for 5 days. Have I ruined it completely? Is it even worth cooking? Re: Have I just ruined my first ham? Welcome. Yes, it's worth cooking, and the chances are it'll be lovely. Thanks for the quick response. I was worried that it might be toxic. Enjoy it. If the meat was fresh, even if the cure's wasn't too good, it shouldn't be dangerous in five days: not that I'm thinking that THAT was the case! I'm very interested in brine cures, but so few people use them nowadays. I'd be most grateful if you would post the recipe and method you used along with your impression of how well it cured, how salty it was etc. Yes, it was fresh free range pork prepared specifically for me by the butcher. I put it in the brine the same day I bought it. I will take a photo as well but reserve the right not to post it if for whatever reason it hasn't worked. This is actually my second attempt at making boneless ham. The first ended up being half pork - half ham. It was brined for the correct amount of time (24 hours per 500g?) but the cure obviously didn't reach the middle. I also boiled it at too high a temperature I think so it was a little dry. It was only a small piece (1.1kg) so my husband and I ate it over the next couple of days rather than keeping it for too long. This time I used a marinade injector to pump some of the brine into the middle. When you say few people use brine cures these days, do you mean they mainly use a dry curing method? Thanks for the feedback, I really appreciate it and do feel free to point out any mistakes you think I'm making. Thanks Crispy. Perhaps it's just members here, but most people seem to inject, dry cure, or use a mixture of both. I guess it's to do with it being so difficult to calculate cures accurately for small-scale home-curing. I just find it simpler than pump and rub tbh. Crispy, they do need time to equalise after initial curing which will help ensure even distribution throughout the meat. Would you mind elaborating on this? Do you remove the pork from the brine and leave it for a few hours - or days before cooking it? Overall I’m pleased with the result but would like to improve it. The texture is just what I’m looking for - a mixture of velvety and meaty. I don’t think the flavour is as good as it could be - not hammy enough and too sweet. I need to adjust the amount of sugar used I think - the saltiness seems just right. I’ll look through the forum to find some recipes. I found the brining method very easy and will continue doing it this way. The butcher was very helpful. Initially I bought a skin-on boned leg of pork and when I told him I was going to make ham with it he said if he’d known that he would have recommended a different type of cut. He described it as two primals joined together - a silverside and a topside if I recall correctly. So I cooked the pork leg as a roast instead and ordered what he suggested and this is the result. When I went to pick up the pork he was quite busy so I told him not to bother tying it up for me and that I’d do it myself (I also took the rind off myself). It wasn’t as easy as I thought and the end product wasn’t as compact as I’d have liked (I’ll ask him to do it next time). I also didn’t have any idea how big a piece consisting of ‘two primals’ would be so I’m not sure if we’ll get through it all quick enough. How long does ham keep before it starts to go off - days? weeks? 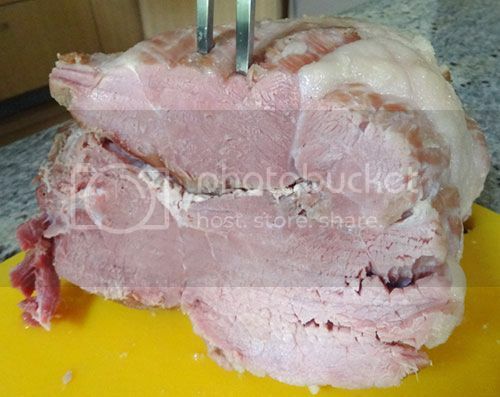 Rather than boil the ham, this time I baked it in an oven bag at 130˚C until the internal temperature reached 68˚C. It came up another 10˚C at least after I took it out of the oven and the bag was full of liquid which I’m assuming was a lot of the flavour. Next time I’ll try boiling it again but at a much lower temperature.